The colorful sky at sunset adds to the unique geological feature of Castle Butte in the Big Muddy Badlands in Saskatchewan, Canada. Thin wisps of clouds tinged in pink hues float across the sky above Castle Butte in the Big Muddy Badlands in Southern Saskatchewan, Canada at sunset. Castle Butte prominently stands out across the landscape of the Big Muddy Badlands which stands 70 meters above the valley floor. 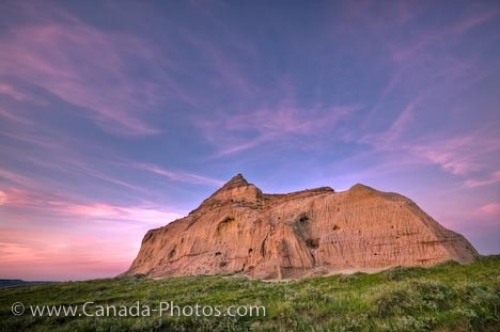 Castle Butte has become a famous tourist attraction where people climb this sandstone/clay formation, examine the caves and look out over the beautiful scenery of Southern Saskatchewan, Canada. Castle Butte at sunset in the Big Muddy Badlands, Southern Saskatchewan, Canada. Picture of the colorful sky above the unique formation of Castle Butte in the Big Muddy Badlands in Saskatchewan, Canada.